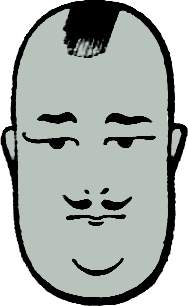 Old Der Bingle, circa 1932. May 3, 2016 marks the 113th birthday of the best selling recording star of the 20th century, and one of the biggest pop-culture icons in all of history, Bing Crosby who was born on this day in 1903. Harry Lillis Crosby was born May 3, 1903 in Tacoma, Washington, and moved to Spokane at the age of three. As a youngster, he acquired the nickname “Bingo from Bingville” from a neighborhood girl with whom he shared an interest for The Bingville Bugle, a weekly feature in the Spokesman-Review. 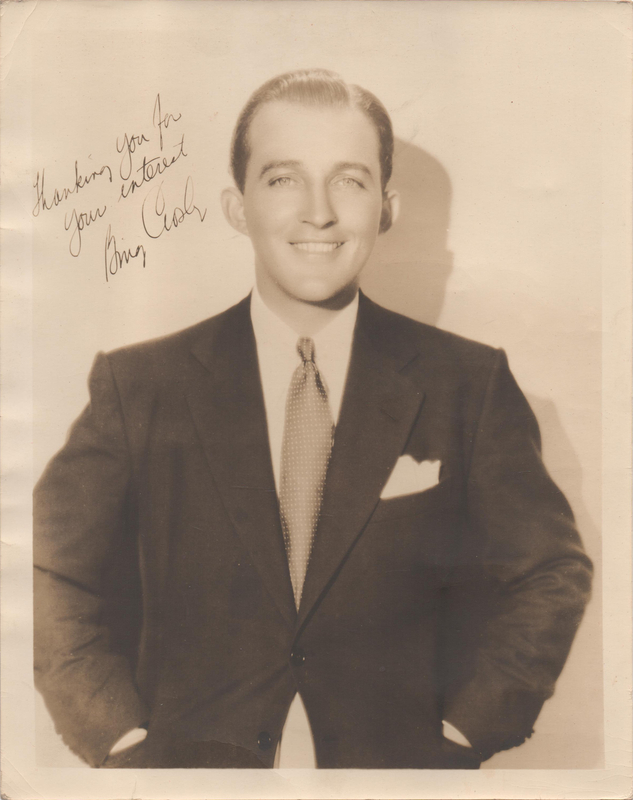 The nickname was later shortened to “Bing.” As a boy, Crosby worked at the Spokane Auditorium, where he saw Al Jolson perform. While attending Gonzaga University, Bing joined a band of high school students, including Alton Rinker, called the Musicaladers. 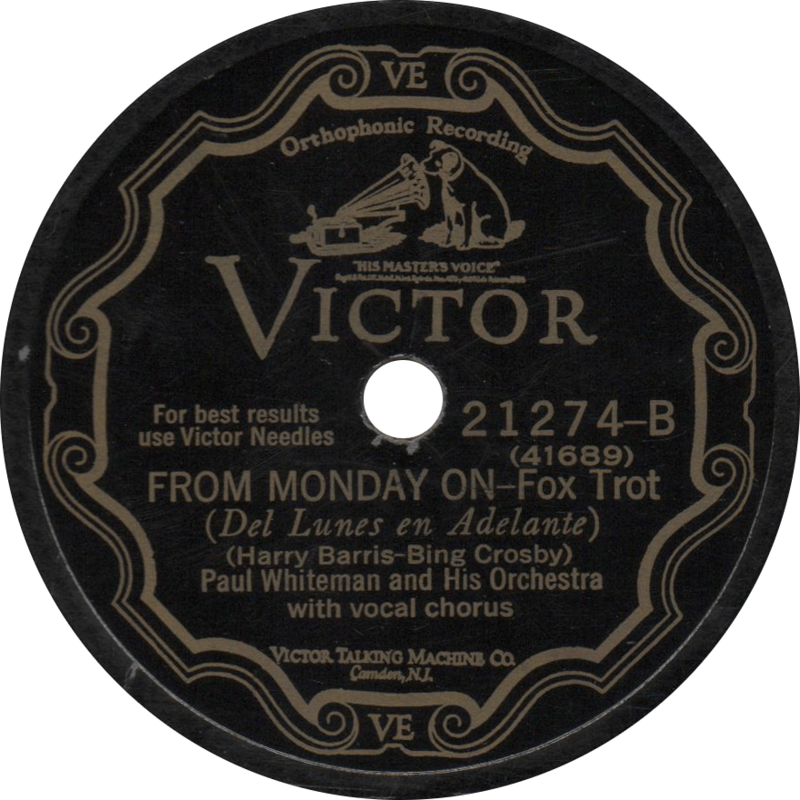 After the group disbanded, Bing and Al went south to California, making their first record with Don Clark’s orchestra in October of 1926. 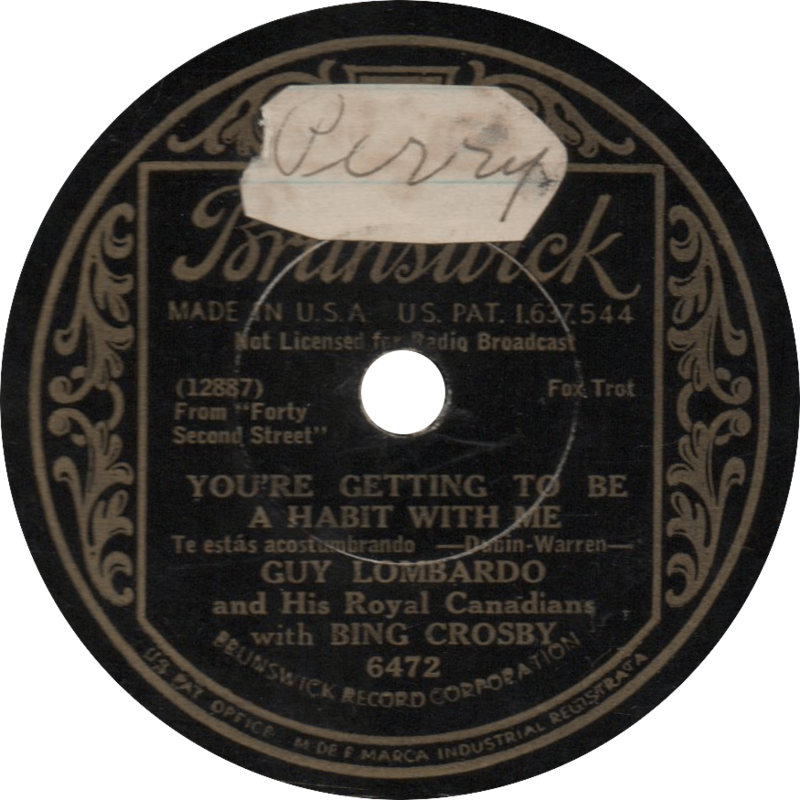 Crosby and Rinker were soon discovered by Paul Whiteman and drafted into his band as the “Rhythm Boys”, with Harry Barris added to make it a trio. 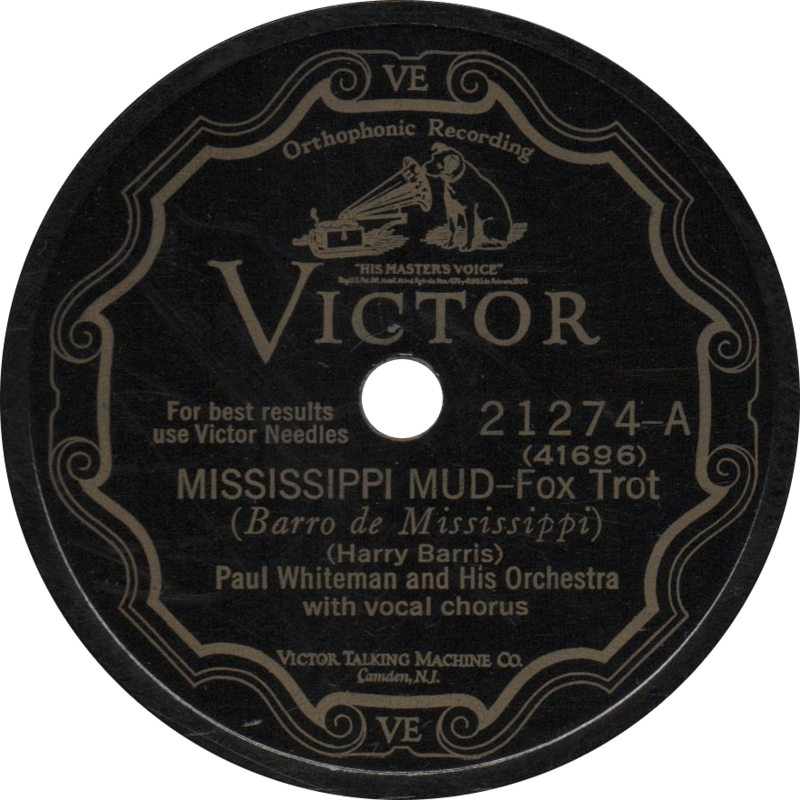 The Rhythm Boys stayed with Whiteman’s troupe until 1930, when they decided to remain in California after appearing in King of Jazz. The group broke up later in 1930, leaving Crosby as a solo act. 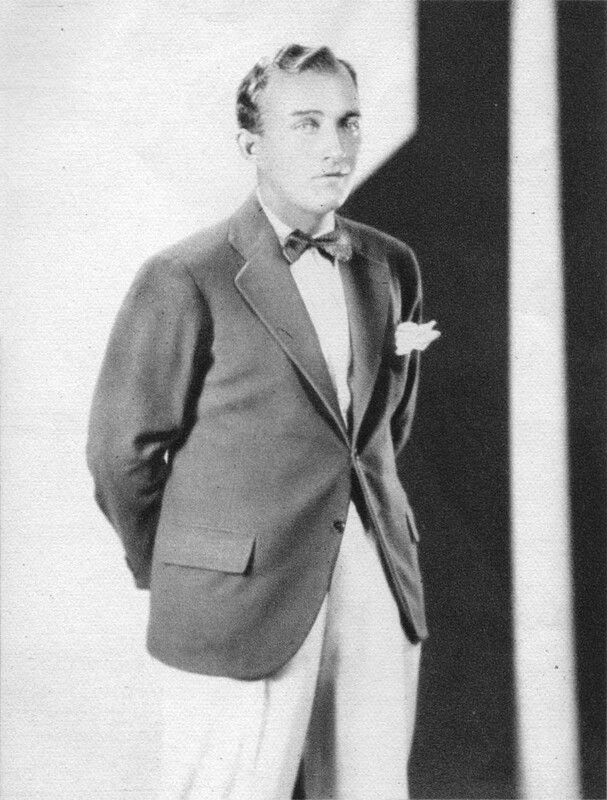 Appearing for a time with Gus Arnheim’s orchestra at the Cocoanut Grove, Bing had a early success with “I Surrender, Dear”, and after leaving Arnheim’s company, had his first big hit with “Out of Nowhere” for Brunswick records. 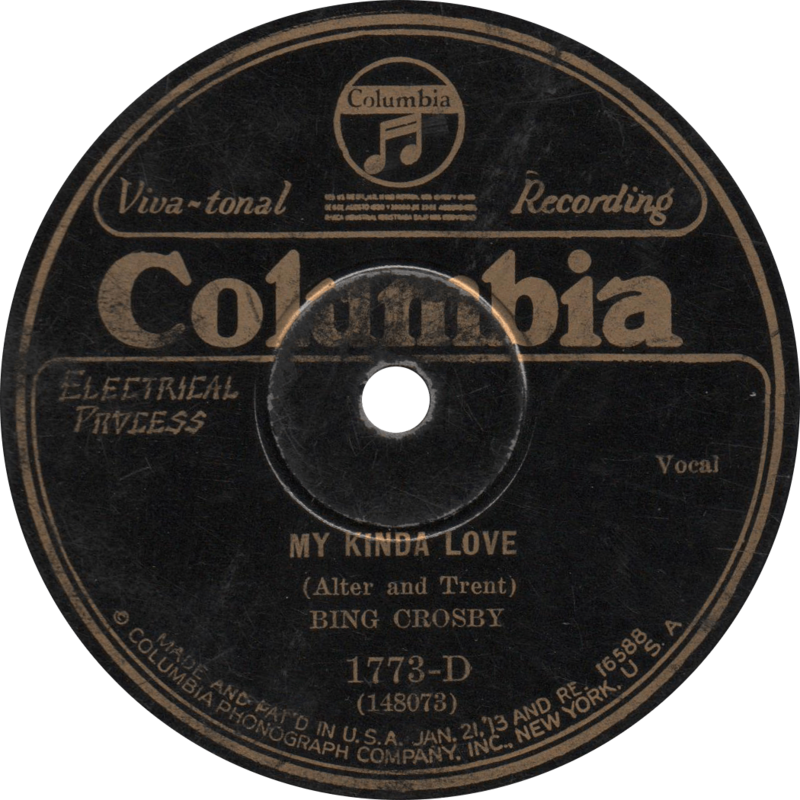 On September 2, 1931, CBS began airing 15 Minutes with Bing Crosby, which helped to further catapult Bing into his huge success. 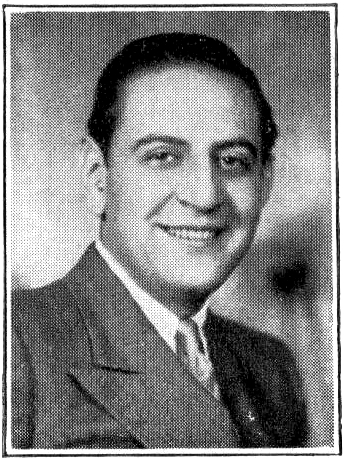 Crooning popular ballads in the same vein as Russ Columbo, with periodic whistling and interjections of his trademark “buh-buh-buh-boo”, Bing hit his peak in the 1930s, and stayed there for about a decade. Over the course of the decade, Crosby made numerous appearances in motion pictures. His first starring role came in 1932 with The Big Broadcast, which also featured the Boswell Sisters, Cab Calloway, and many other great talents. His greatest film success came in 1944 with Going My Way, his performance in which won him an Academy Award for Best Actor In 1934, Bing followed producer Jack Kapp to the newly founded Decca records (and in the process sacrificed much of the jazz that his style had previously held). On Christmas Day in 1941, Bing introduced Irving Berlin’s “White Christmas”, becoming the best-selling single record of all time with his May 1942 recording for Decca. In the 1940s, Crosby pioneered the practice of pre-recording his radio programs. Though his style of music fell from favor by the 1950s, Bing remained popular throughout the rest of his life, at the end of his life appearing in a Christmas special with David Bowie. After a game of golf in Madrid, Bing Crosby collapsed and died from a massive heart attack on October 14, 1977. 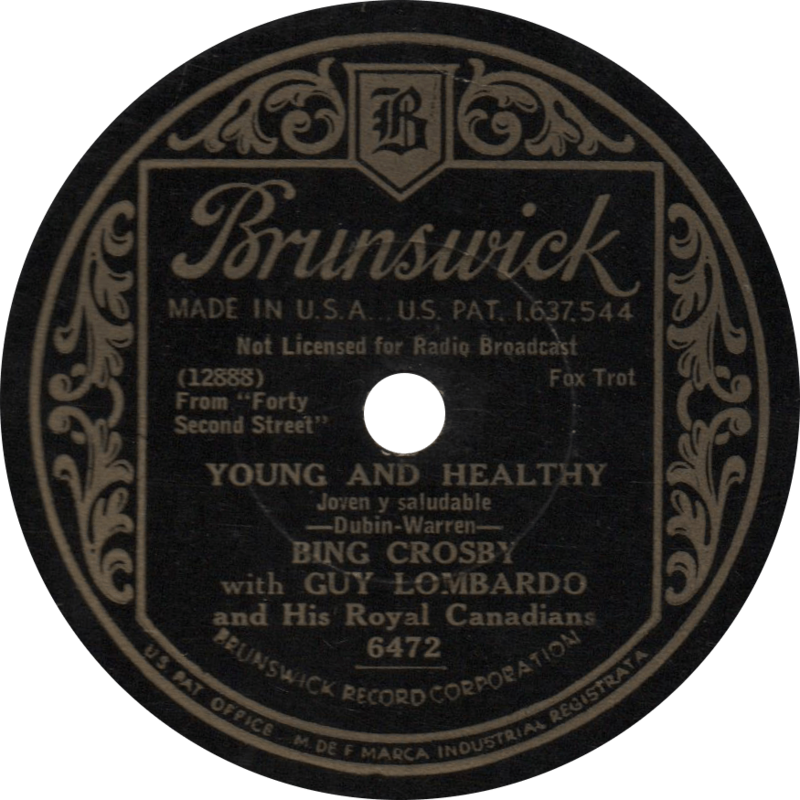 Brunswick 6226 was recorded November 23 and December 3, 1931 in New York City. The band, probably a studio group, as Brunswick commonly employed, may have included Mannie Klein and Jack Mollick on trumpets, Tommy Dorsey on trombone, Benny Krueger on alto sax, possibly Harry Bluestone or Harry Hoffman, Walter Biederman, Walt Edelstein, Joe Baum on violins (lordy, that’s a whole lot o’ violins! ), possibly Joe Meresco on piano; Eddie Lang on guitar; Hank Stern on tuba and Larry Gomar on drums. First up is Bing’s radio theme song, “Where the Blue of the Night (Meets the Gold of the Day)”. It’s worth noting that this take, “A”, is different than the one I’ve heard on modern reissues. 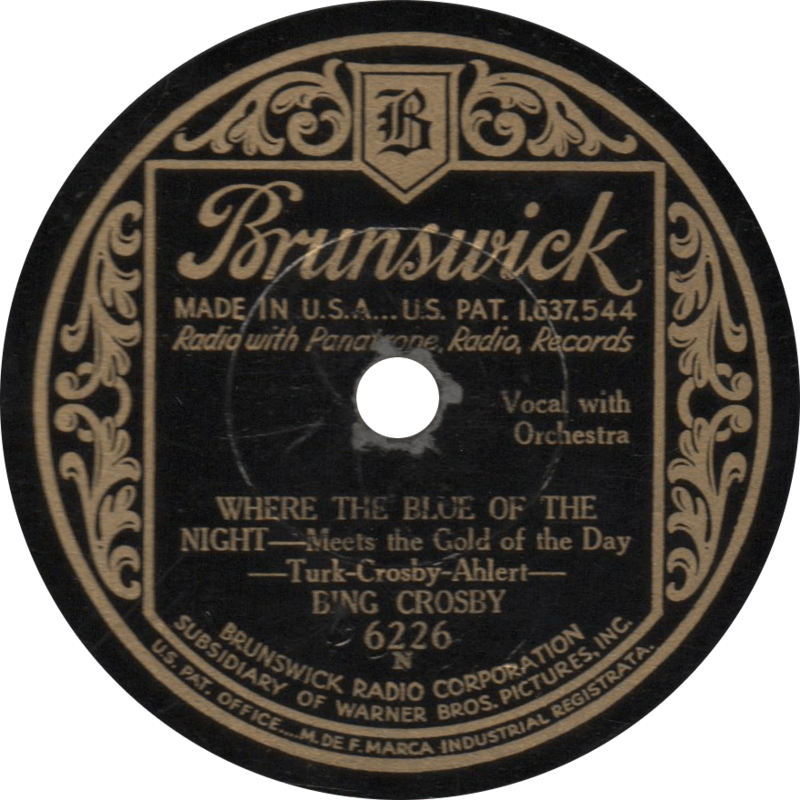 Where the Blue of the Night—Meets the Gold of the Day, recorded November 23, 1931 by Bing Crosby. 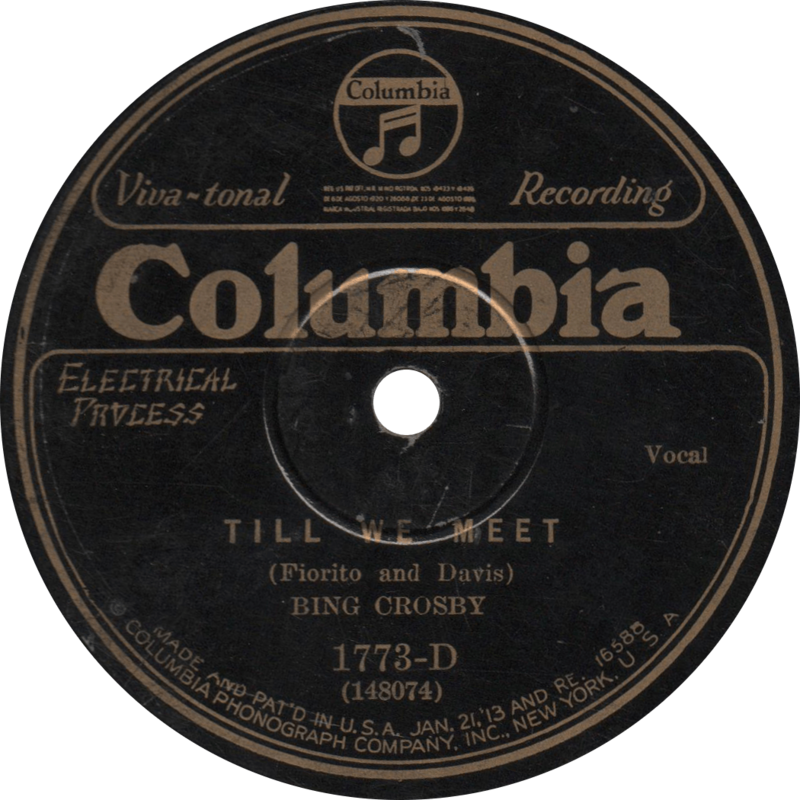 The reverse, “I’m Sorry, Dear”, is a fairly typical of Bing’s early ’30s romantic songs, much like his classic “Just One More Chance”. 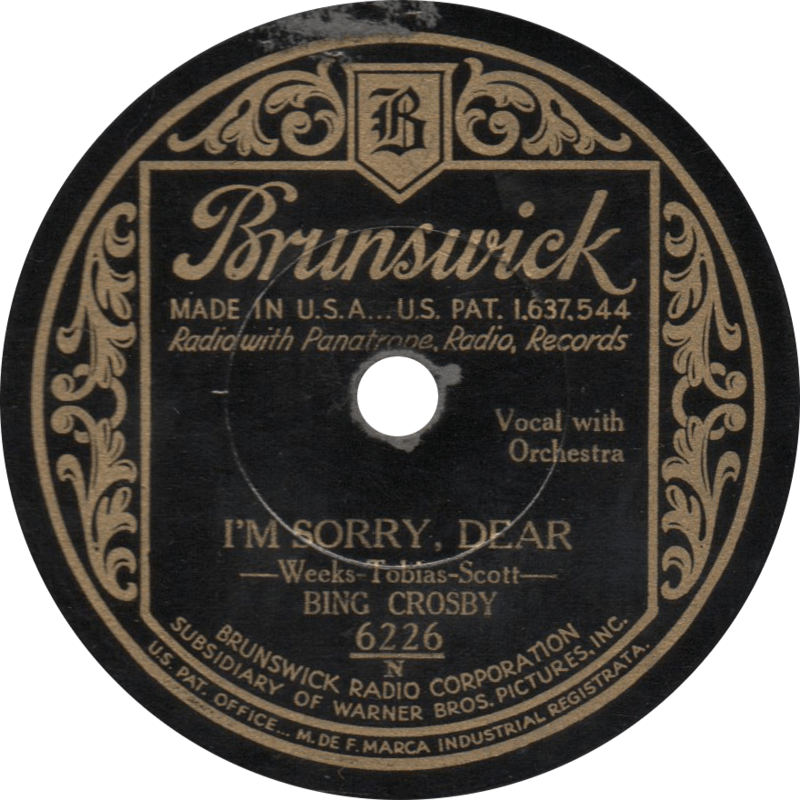 I’m Sorry, Dear, recorded December 3, 1931 by Bing Crosby.